Brushes come in all shapes and sizes and often it can be confusing as to which ones you should choose, especially if you are new to face painting. 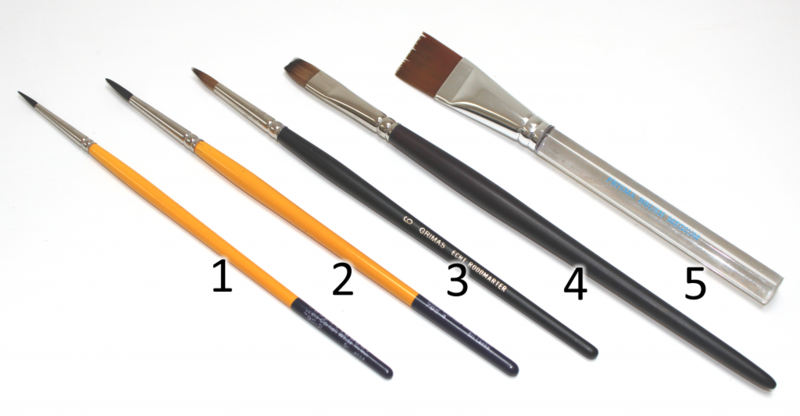 There are also many different brands out there, some selling the same style of brushes (e.g. round no. 4) but under different names, such as Loew-Cornell or Mark Reid. I haven’t tried every single brand or style available on the market so please keep that in mind. The brushes I have listed are my favourites, but there may well be an alternative that is equally as good, I just haven’t tried it. Brushes are very personal to each artist and we all have a different set of criteria that we want our brushes to meet, what works for me may not work for you. I have around 15 brushes that I keep in my kit but I tend to find that I always stick to the same 5 every time. I couldn’t be without a single one of them. This is my go-to brush for most designs. 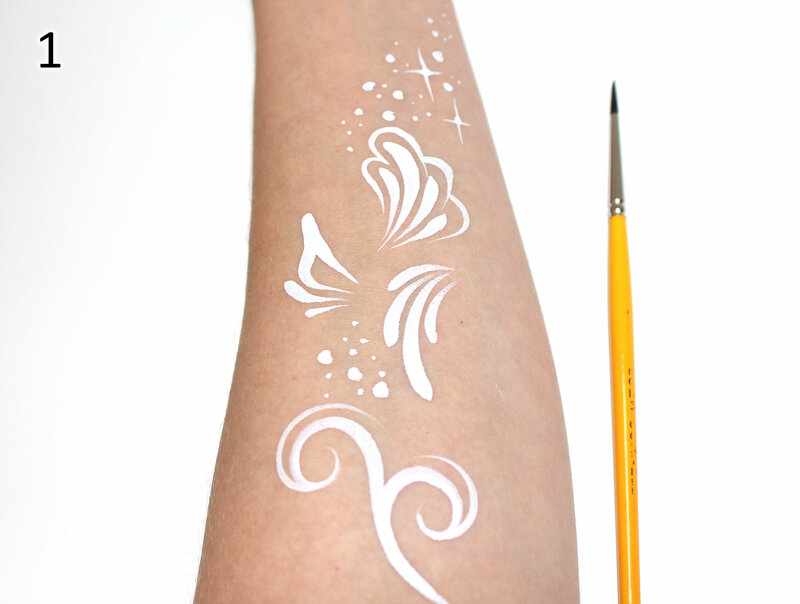 It has a very fine tip, perfect for creating thin lines and teardrops. I have had mine for around 18 months and it has lasted well considering how much I use it. This brush is almost identical to the No.2, it’s just a little fatter. If you use a light hand you can easily create the same strokes as the first brush but it has the added benefit of being able to paint thicker lines when needed. 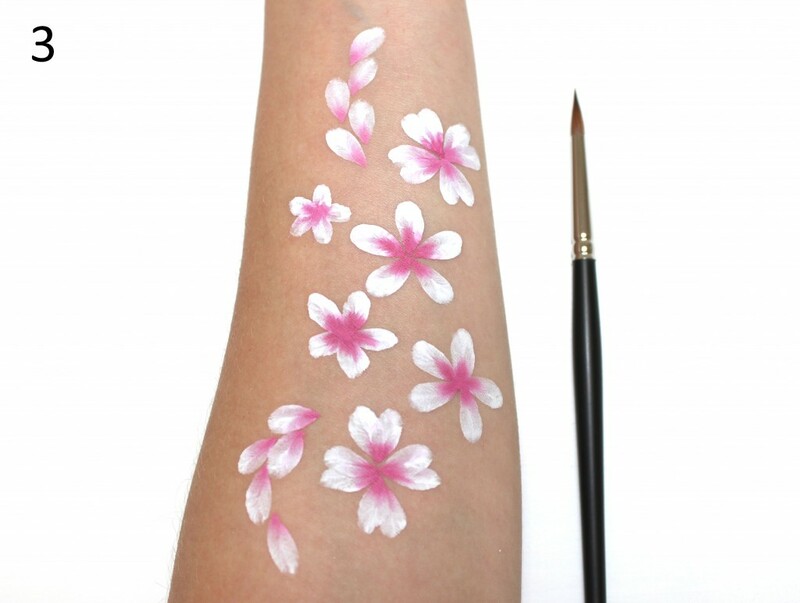 With this brush I can create perfect flower petals every time. The bristle aren’t too long and they taper off to a very fine point. 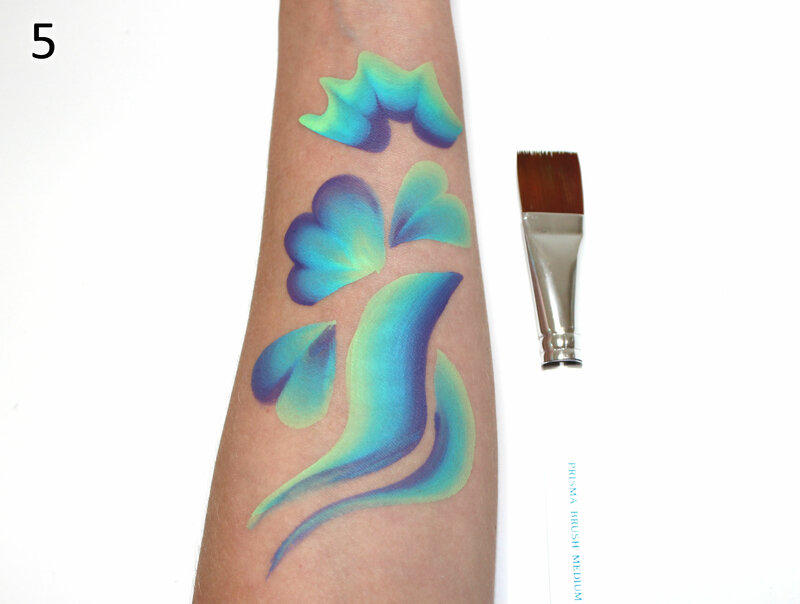 You simply load 1,2 or 3 colours and then press the brush on to the skin. Easy Peasy! I don’t use this brush for any line work at all, just flowers. I use this brush for all of my dry blending. 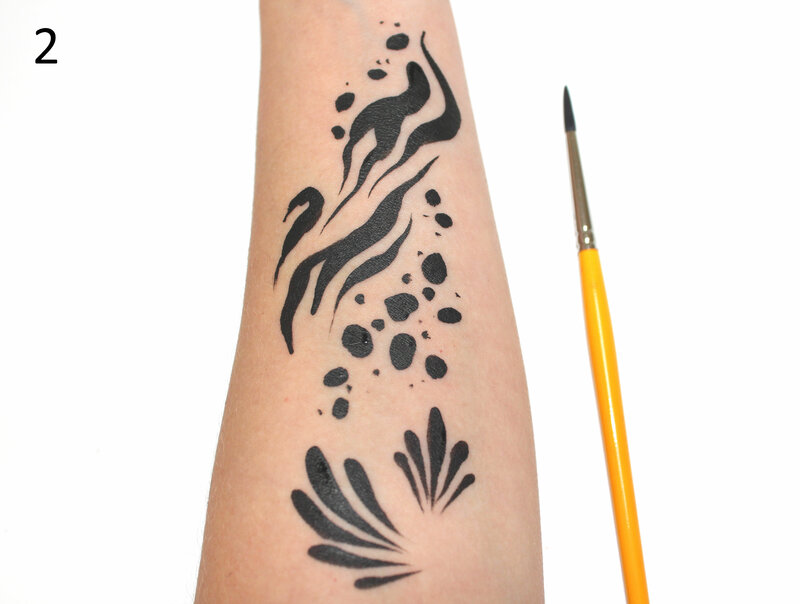 I’ll paint a line with one of my round brushes and then before it dries I smudge out the edge with a clean, dry No.10. 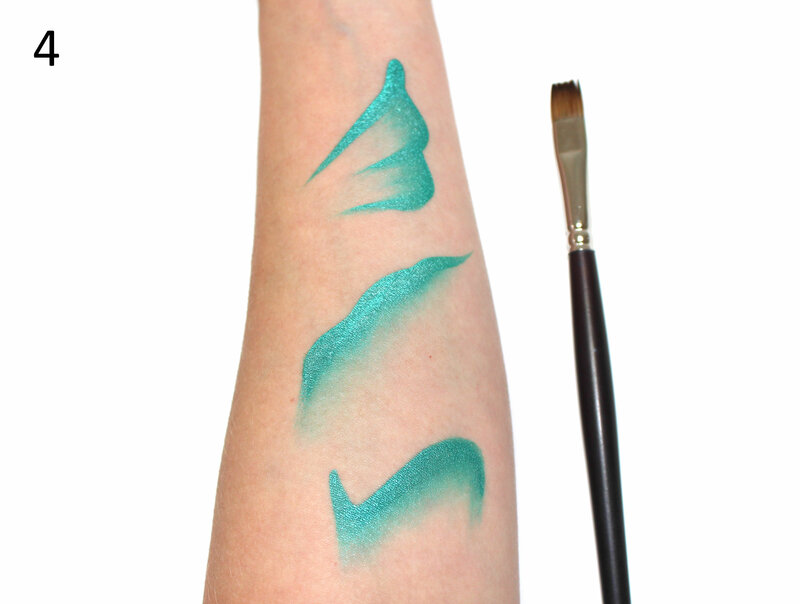 Dry-brush blending on butterfly wings & around the eyes of zombies and monsters. This brush works amazingly well with split cakes and rainbow cakes to create multi-coloured strokes and designs. It’s also one of the best looking brushes I own. I love the transparent design, it looks very professional and the plastic won’t crack and chip like normal painted/wooden handles. Do you know of anyone who supplies Australia? I know you probably won’t but it’s worth a try! I love your work!